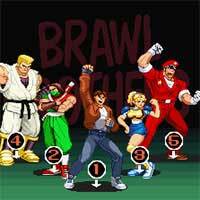 Brawl Brothers A classic retro 2 player side scroller beat ’em up where you save your friends from kidnappers. You live at Bayside City and news of people disappearing is on the rise. Rumors that shady human cloning experiment is responsible. It just got personally when after three friends from their martial arts gym get abducted. Set off to rescue your little buddies. Fight dozens of bad guys through several stages and pick up various weapons from sticks, guns, to grenades and more. Brawl Brothers! Use the burst energy when low on health to deal more damage and defeat more enemies. Take on the evil organization by yourself or team up with a friend in 2 player co-op mode. Enjoy it on Creetor.